Heya! It has been a while, but the sun is out so I thought I’d share a gem of a find! One of the longest running logistical headaches with certificates has been renewing them, and subsequently binding them in IIS. 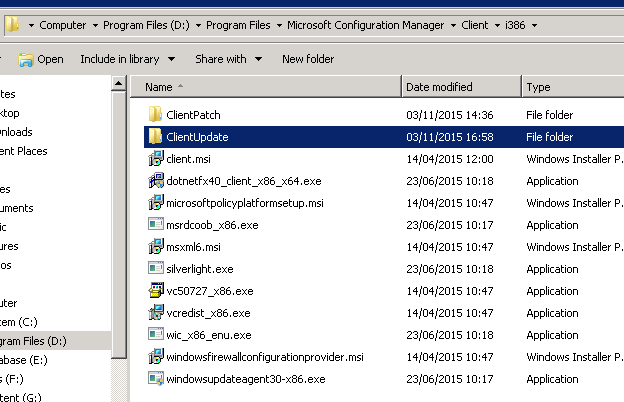 Client certificates aren’t a problem; a wee sprinkle of Group Policy, and all your certificates just automagically renew. However, when you throw server authentication couple with Subject Alternative Names into the mix, you lose the truly luxurious option of automatic renewal. This entry was posted in Certificate Authority, Client Enrollment and tagged Certicate Renewal, HTTPS, IIS 8.5, IIS Bindings, Internet facing, PKI certificate, Server 2012 R2 on March 13, 2017 by Leldance40k. Following on from my previous blog here, I had jumped through the Microsoft hoops to get my nice shiny gold padlock and green bar. However all was not delivered as expected! This entry was posted in Certificate Authority, Extended Validation, PKI and tagged 0x80094001, EV, Extended Validation, HTTPS, PKI, PKI certificate on November 1, 2016 by Leldance40k. Extended Validation – the Holy Grail of HTTPS? Ever since I started tinkering with SSL and HTTPS, I have had an unnatural hankering to move over into Extended Validation. It sounded simple enough, as per these Microsoft articles here, here and here. This entry was posted in Certificate Authority, Extended Validation, PKI and tagged EV, Extended Validation, HTTPS, PKI, PKI certificate, SSL on October 21, 2016 by Leldance40k. 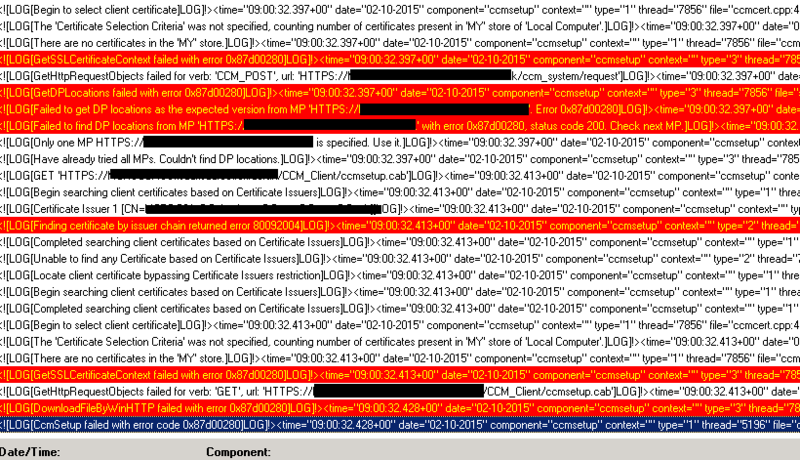 Missing Certificates and Config Manager Client Woe! No policy ID! 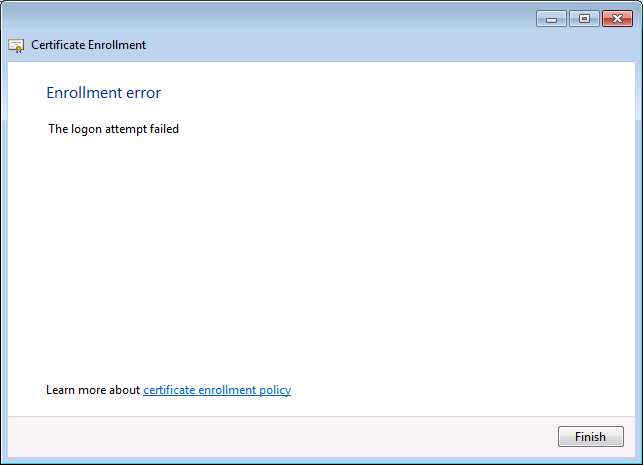 So the PC isn’t even talking to the enrollment point. I checked logs, nothing. So I am a bit stuck. I suppose these things do happen! I have posted on TechNet and I’ll come back to this post later(tm)! This entry was posted in Certificate Authority, Client Enrollment and tagged 0x80092004, 0x87D00280, Client deployment is waiting for client installation content from distributions points, Config Manager Client, Finding certificate by issuer chain returned error 80092004, HTTPS on February 17, 2015 by Leldance40k. 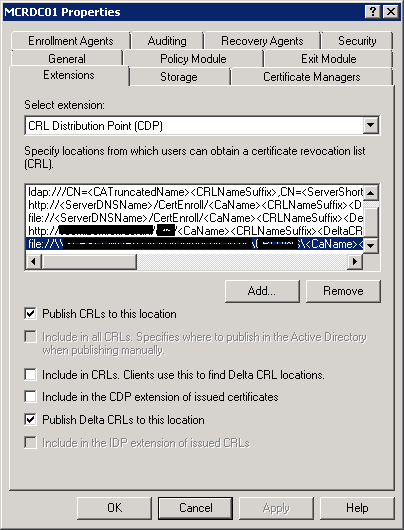 Creating the Certificate Revocation List – Part 3. My final blog about this topic… and following on from here. In order to confirm the certificates are picking up the CDP, they need to be reissued, as these changes will only affect certificates issued post change. No reference to a HTTP source. …and as you can see htere is no reference to a CDP at the bottom. 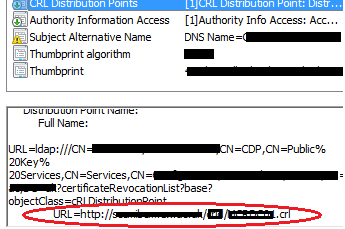 I then manually renewed a certificate on my test PC, opened the certificate and confirmed the presence of a CDP. …and now we have a publicly available CRL. Le fin! Well sort of… now I have to deploy an updated certificate to several thousand PCs. Joy. This entry was posted in Certificate Authority, PKI and tagged .CRL, CDP, HTTPS, Internet facing, PKI, PKI certificate on December 4, 2014 by Leldance40k. 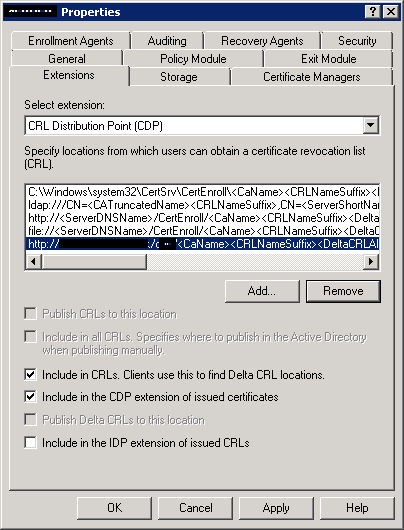 Creating the Certificate Revocation List – Part 2. Following on from my earlier blog, I had managed to successfully publish the CRL to my web server. However, in order to verify everything is working, you should browse to the URL and access the .CRL files. …but I could not download them; I received a 404 error message. I did some digging and verified that I had set allowDoubleEscaping, and that the .CRL was specificed as a valid MIME type on the web server. 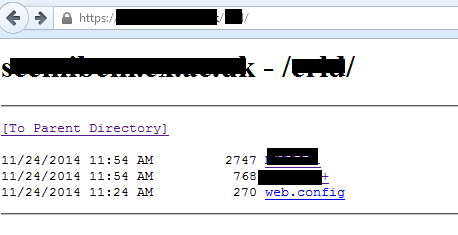 I checked the IIS logs and they indicated this was a MIME type error. So what was wrong? Well the clue is in the above screenshot! Both files are missing their .CRL extension. Verifying the MIME entries made me realise that the published CRL files were missing their .crl extension. Hence IIS did not have a valid MIME type to handle the files which resulted in the 404 error. I manually added .CRL to one of the files and bingo, I could download the content. I then went back to the CA to review the previous work I had done, setting up the Certificate Distribution Point. 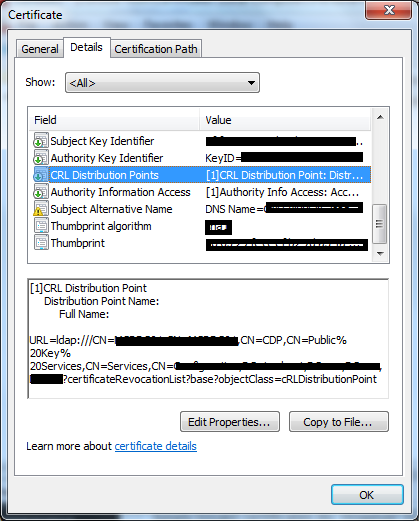 The final job is to confirm the new certificates contain the CDP. All done here! This entry was posted in Certificate Authority, PKI and tagged .CRL, 404, CDP, HTTPS, Internet facing, PKI, PKI certificate, SSL on December 1, 2014 by Leldance40k.